Vintage loving girls like ourselves need style icons who aren’t afraid to revisit the past. Michelle Williams is everywhere right now, but you can be sure we (and you too, right?) have loved her since she was Jen Lindley – although we’re glad her style has grown up since then! Michelle is (almost) always the perfect intermediary between 1960’s mod fashion and the sleek, polished styles of today, with her perfect pixie haircut, a body like Twiggy, and a tendency towards black and white. Now, after her incredible portrayal of Marilyn Monroe, she can add 50’s pin-up to her repertoire as well. We had fun putting together our week of white accessories for Spring, for you! Now that everything is live in our shop, head on over to see the full info on each of them! 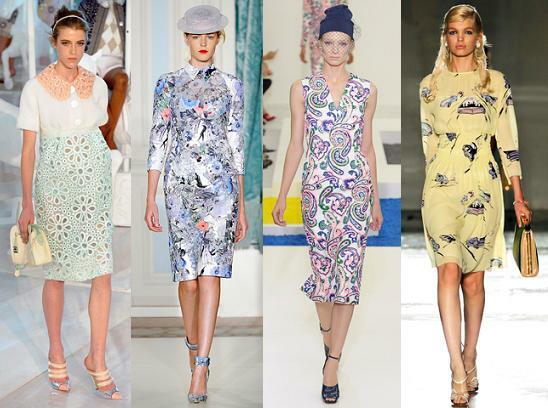 Can we just drool for a moment over Alice + Olivia’s Spring 2012 presentation that debuted yesterday? The brand is always applying vintage looking touches to their modern looks, but this season just hits it out of the park for us. Candy colored retro styles blend most of our favorite era’s for fashion – 20’s, 50’s, 60’s and 70’s – all into one collection. The shoes, the hats, the sunglasses! Neither Lise nor Katina are girly girls, but these pastels and florals are looking pretty tempting for this spring.